2" x 1" tube construction, (4) 7/16" holes for wall mounting, Round tube to minimize rope chaffing, Hardware included. Fitness and Training Rope 1.5 inch Diameter. 50 Ft. Fitness and Training Rope 2 inch Diameter. 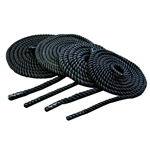 30 Ft.
(4) 7/16" holes for permanent mounting, Round tube to minimize rope chaffing, 1" standard post for weights. Build power, increase explosiveness and elevate performance with the Covered Conditioning Rope. This 40-foot covered rope is a key component for focused, high-intensity workouts. Fitness and Training Rope 2 inch Diameter. 50 Ft. This portable training rope anchor weighs less than 50 lbs and accommodates up to 12 ropes. Rubber base keeps anchor station firmly in place and is easy on floors. Add weight plates for more weight and stability. No assembly required. 24" x 24" x 11". Weight plates not included.